Today on First Kiss Friday I have as a guest Bluestocking Belle Susana Ellis and her characters from A Home for Helena. Happy reading! The garden was lit with Chinese lanterns, which flickered on the water from the lake beyond. “It’s beautiful.” Helena breathed deeply of the fresh air as she took in the sight and aroma of the charming vista. I’d be ever so much better if you would kiss me. Her breath quickened. It’s the same with me. “Call me Helena,” she said breathlessly. “Not terribly,” she responded, as she raised her lips to his. Their lips touched lightly at first, and then with more pressure as his hands moved down to caress her back. Her nerve endings tingled, wanting more. She clasped her hands around his neck and opened her mouth for his seeking tongue. She was close enough to hear the rapid beating of his heart, and yet it wasn’t close enough. Breaking away, he clasped her head in his hands and gave her a searching look before he took her lips again, not tentatively this time, but with the force of possession. Warmth radiated through her body. All inhibitions faded away in her hunger to merge her body with his. Startled at the interruption, they drew apart and looked at each other in bemusement. The luckless Lucinda followed her mother out of the garden, and Helena made an effort to repair her hair. “I suppose I should apologize,” James began, and then stopped when he saw the confusion on Helena’s face. What was I thinking? I can’t get involved with him. Even if I wanted to stay here and marry, how would I ever explain how I got here? He’d send me packing to the insane asylum first chance he got, and under the circumstances, I couldn’t blame him. His nostrils flare. “You’ve been kissed before,” he drawled. And more. But he doesn’t need to know that. He’s not for me. This is nothing but a passing fancy. Helena wanted to throw something at him. “Why should he? He has no authority over me.” Too late, she realized her mistake. Helena was so angry she could spit. Instead, she stepped forward and slapped him. Hard. Believing that she has been misplaced in time, Helena Lloyd travels back two hundred years in an attempt to find out where she belongs. Widowed father James Walker has no intention of remarrying until he makes the acquaintance of his daughter’s lovely new governess. 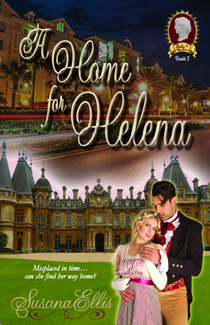 Lady Pendleton, a time-traveling Regency lady herself, suspects that these two belong together. First, however, she must help Helena discover her true origins—and hopefully, a home where she belongs. This is Book 2 of The Lady P Chronicles. Susana Ellis has always had stories in her head waiting to come out, especially when she learned to read and her imagination began to soar. A former teacher, Susana lives in Toledo, Ohio in the summer and Florida in the winter. She is a member of the Central Florida Romance Writers and the Beau Monde chapters of RWA, Maumee Valley Romance Inc., and is one of the infamous Bluestocking Belles.